Click image to enlarge Crims Island and Bradbury Slough, Oregon. View from near Port Westward. Image taken August 27, 2012. Bradbury Slough runs on the south side (Oregon side) of Crims Island, separating the island from the Oregon shore. The slough stetches from approximately Columbia River Mile (RM) 54 through RM 57. 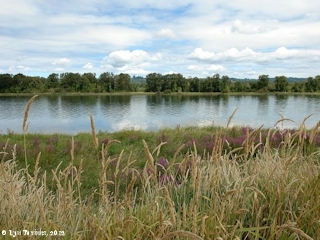 On the upstream end of the Bradbury Slough is Mayger, Oregon and on the downstream end of the slough lies the Oregon development of Port Westward. Inbetween is the broad flat plain of the Clatskanie River/Beaver Slough delta, which Lewis and Clark called "Fanny's Bottom". "Fannie's Island" (Crim's Island) and "Fanny's Bottom" were named after Clark's sister Fannie. In 1841, Charles Wilkes of the U.S. Exploring Expedition called Bradbury Slough "Kinak Passage". Bradbury Slough and the one-time railroad station of Bradbury (later re-named Locoda), were named for Clement A. Bradbury, an early settler. The U.S. Bureau of Land Management's General Land Office Records (GLO) website (2011) has a Clement Bradbury and "Heirs of Ann W. Bradbury" being granted title to 640.63 acres of T8N R4W Sections 15, 22, 23, 26, and 27, on February 2, 1867 (1850 Oregon-Donation Act), and Clement Bradbury being granted title to 103.81 acres of T8N R4W Section 26, on June 1, 1882 (1820 Sale-Cash Entry). The Bradbury Post Office operated from December 1881 to July 1890. 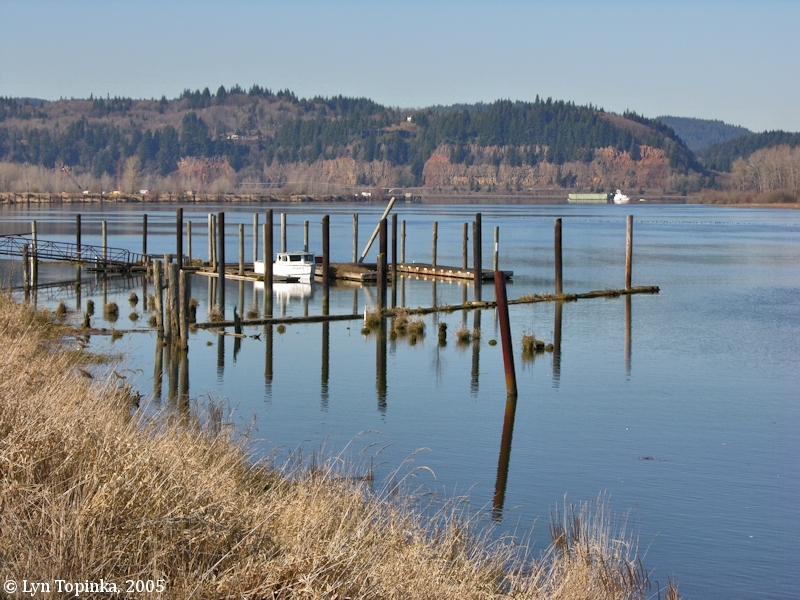 Click image to enlarge Bradbury Slough, Oregon, looking towards Oak Point, Washington. Image taken February 21, 2005. 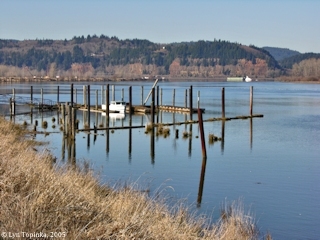 The Oregon development of Port Westward lies at the western end of Bradbury Slough, at approximately Columbia River Mile (RM) 53. Fantastic views of Mount St. Helens can be seen from the road following Bradbury Slough. 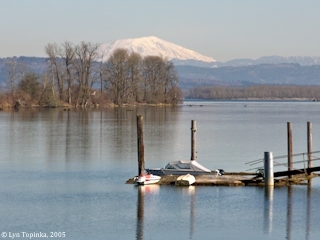 Click image to enlarge Mount St. Helens, Washington, from Bradbury Slough, Oregon. Crims Island is on the left. Image taken February 21, 2005. 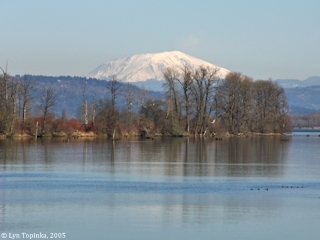 Click image to enlarge Mount St. Helens, Washington, from Bradbury Slough, Oregon. Crims Island is in the middleground. Image taken February 21, 2005.
a cold wet morning. rain Contd. untill [blank] oClock we Set out early [from Prescott Beach, Oregon, area] & proceeded on the Corse of last night &c.
to a point of high land on the Lard Side, passed two Lodges on the Lard Side at 2 miles in a bottom, The high land [Carrolls Bluff] leave The river on the Stard. Side. passd. a remarkable Knob of high land on the Stard. 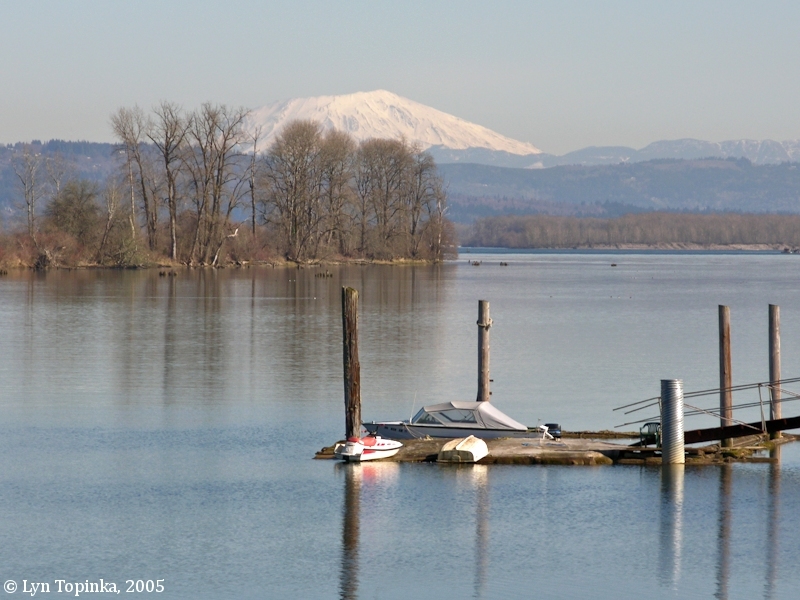 Side at 3 miles Close on the Waters edge [Mount Coffin, Lewis and Clark missed the Cowlitz River mouth] — ... passed a Island nearest the Lard. Side at 10 mile [Walker Island] the head of a Isd. on Std. [Fisher Island] opposit High Cliffs [Green Point, location of today's Mayger, Oregon], with Several Speces of Pine Cedars &c. arber vita & different Species of under groth. The wind blew So hard untill 8 A M. that we detained [at their camp on the Clatskanie River/Beaver Slough, across from the upstream tip of Wallace Island], we gave a Medal [Jefferson Peace Medals] to a Man by the name of Wal-lal-le a principal man among the Cath lah mahs, he appeared very thankfull for the honor Confured on him and presented us with a large Sturgion [Columbia River White Sturgeon]. we Continued our rout up the river to an old Village on the South Side where we halted for dinner. we met on the way the principal Chief of the Cathlahmahs, Sâh-hâh-wâh-cop, who had been up the river on a trading voyage, he gave us some Wappato and fish, we also purchased Some Wappato Soon after halted for dinner at an Old Village <at> on the South point [today's Port Westward, originally was called "Oak Point"] opposit the lower pt. of Fannys Island [Crims Island]. ... here our hunters joined us haveing killed 3 Eagles and a large Wild goose. I had now an oppertunity of Comparing the bald <and> with the grey Eagle; I found the grey Eagle about 1/4 largest, its legs and feet were dark which those of the bald eagle were of a fine orrange yellow; the iris of the eye is also of a dark yellowish brown, while that of the Grey is of a light Silvery colour with a Slight admixture of yellow. 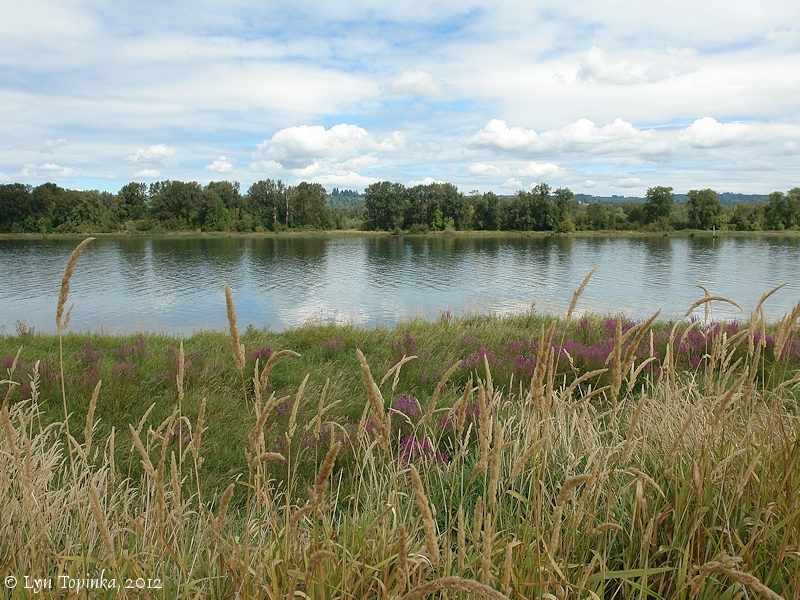 after dinner I walked on Shore through an eligant bottom on the South Side [Clatskanie River/Beaver Slough Delta] opposit to Fannys Island [Crims Island]. This bottom we also Call fannys bottom it is extensive and an open leavel plain except near the river bank which is high dry rich oak land [Oak Point]. I saw Some deer & Elk at a distance in the Prarie. we continued untill late in the evening and encamped on a Small Island near the Middle of the river [Walker Island] haveing made 18 Miles. 2 Indians Visited us this evining.